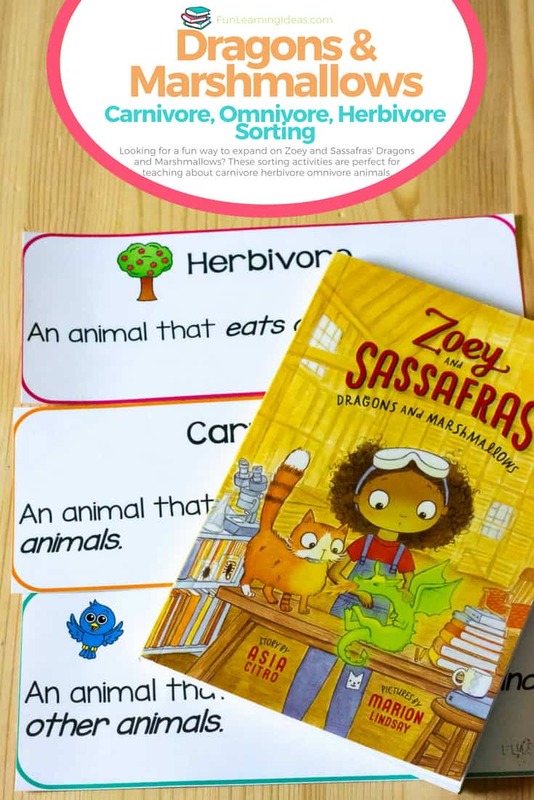 Carnivore, herbivore, omnivore- what do these have to do with Zoey and Sassafras? I will tell you so simply keep reading. I love it when you can expand on a read aloud that my kids love. Recently my daughter discovered the Zoey and Sassafras series and we are in love with it! I tend to have this odd habit of wanting to read books in order, while my kids really don’t care. Luckily common sense prevailed and we started with the first book of the series- Dragons and Marshmallows. I am on a mission to create a strong reading culture in my home. I love reading books and it is something I want to pass on to my children. I want my kids to fall in love with the written word and be transported to far away lands. I want them to walk in someone else’s shoes and see the world through someone else’s eyes. Dragons and Marshmallows introduces Zoey and her cat Sassafras. It also turns out to be her first time taking care of a mythical creature. She had to experiment and figure out what to feed Marshmallow- the dragon. 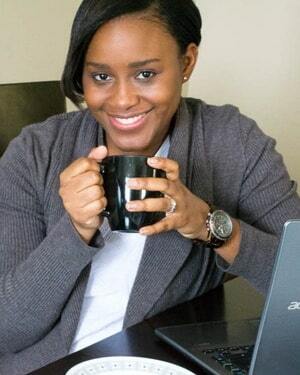 Please note that affiliate links are used below at zero cost to you. They are used here for your convenience. Dragons and Marshmallows (Zoey and Sassafras) Porcupine’s Picnic: Who Eats What? Kingfisher Readers L2: What Animals Eat What Does an Animal Eat? 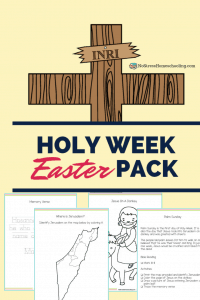 (I Wonder Why) Dueling Dinosaurs & Prehistoric Beasts, Carnivores & Herbivores Coloring Book, Connect the Dots, & Fun Facts! I implore you to read Dragons and Marshmallows but this animal sort can be completed without reading the book. FIRST print the pages of the sorting pack. There are two options: color and black and white. 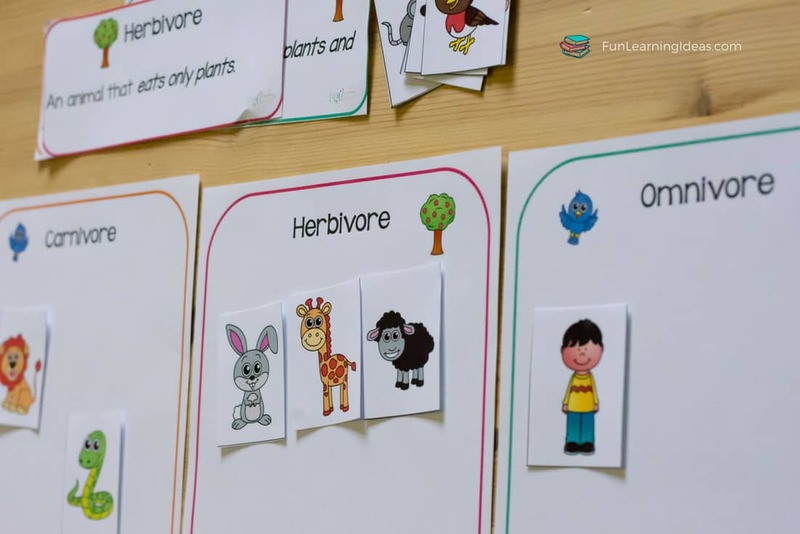 SECOND use a paper trimmer or a pair of scissors to cut out each definition card as well as the animals for the animal sort. First I introduced the 3 words to my children and explained them. Once I did that, I gave them each their card. I also explained the little images on the top of each card. Omnivore has both an animal and a tree to show what they eat. 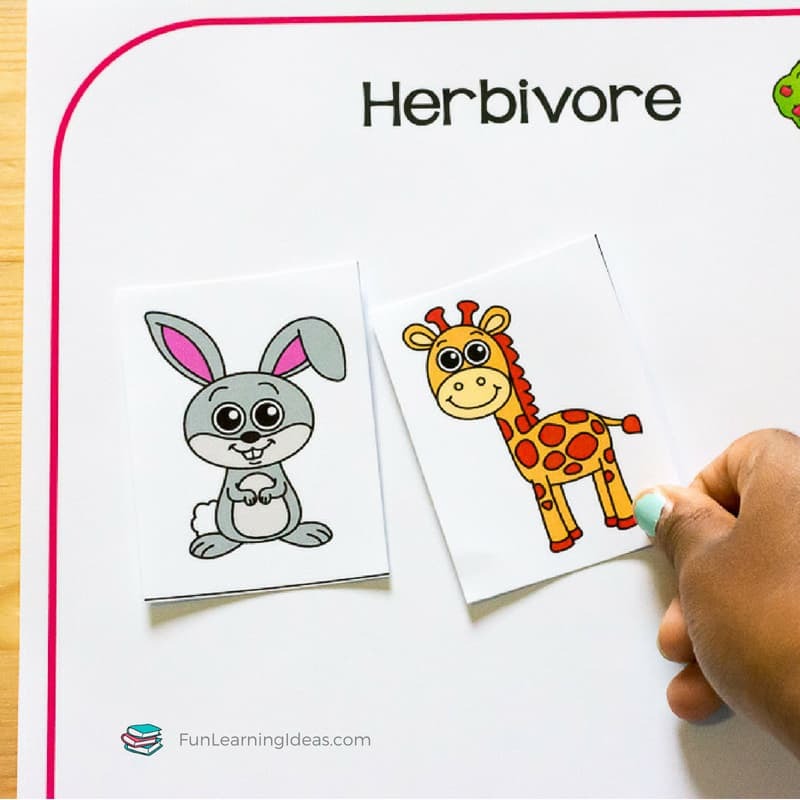 The herbivore card has only a tree on it while the carnivore card has only an animal. Once I felt that they were comfortable with the three words, I went back to Zoey and Sassafras’ Dragons and Marshmallows. I quickly flipped to the pages where Zoey writes about the different type of animals. Then I cut out all the animals for the sorting mats. I then had my kids sort all the animals that they knew together. The ones they were unfamiliar with, we grabbed our First Animal Encyclopedia to figure out what the animals eat. 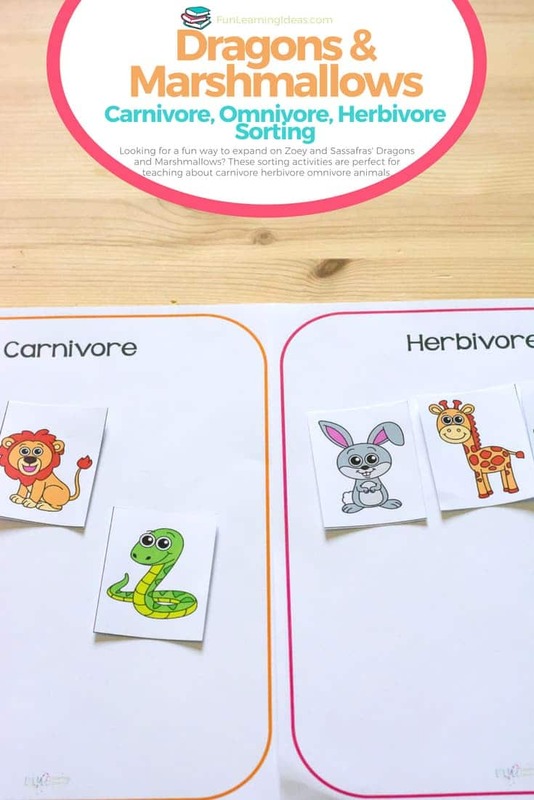 I printed a copy of the animal sorting mats as well as the animal pictures for each of my children. I then set a timer and told them to sort each animal as fast as possible. The person who got the most animals sorted correctly and in the shortest amount of time wins.